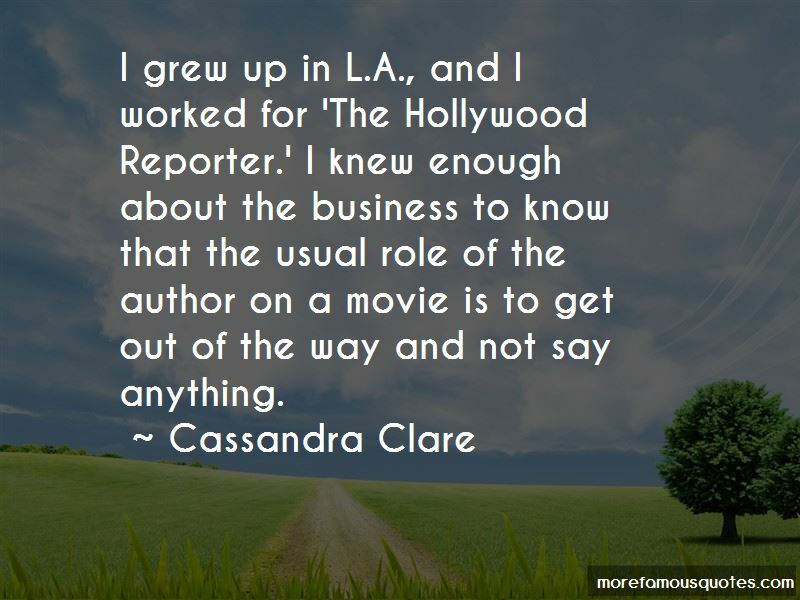 Enjoy the top 3508 famous quotes, sayings and quotations by Cassandra Clare. “Simon stepped between them. "Im not going to let you fight with each other." Do you remember back at the hotel when you promised that if we lived, you'd get dressed up in a nurse's outfit and give me a sponge bath?" asked Jace. "It was Simon who promised you the sponge bath." "As soon as I'm back on my feet, handsome," said Simon. "I knew we should have left you a rat. Jessamine recoiled from the paper as if it were a snake. "A lady does not read the newspaper. The society pages, perhaps, or the theater news. Not this filth." "Dear me," said Will. "Such harsh truths so early in the morning cannot be good for the digestion. “Magnus glanced at Alec and raised his eyebrows "Boo", he said. Jace was grinning. "Come on,surely you've got a phobia or two. What scares you?" Alec thought for a moment. "Spiders," he said. Clary turned to Luke. "Have you got a spider anywhere?" Luke looked exasperated. "Why would I have a spider? Do I look like someone who would collect them?" “Simon stepped between them. "I'm not going to let you fight with each other." They belonged to each other totally, and always would, and that was that. But maybe everyone felt that way? Until the moment they realized they were just like everyone else, and everything they'd thought was real shattered apart. “The moment the door opened, Jace seized up a yellow pencil lying on the desk and threw it. It sailed through the air and struck the wall just next to Luke's head, where it stuck, vibrating. Luke's eyes widened. Jace smiled faintly. "Sorry, I didn't realize it was you." Luke indicated Simon and Clary with a wave of his hand. "I brought some people to see you." Jace's eyes moved to them. They were as black as if they had been painted on. "Unfortunately," he said, "I only had the one pencil." 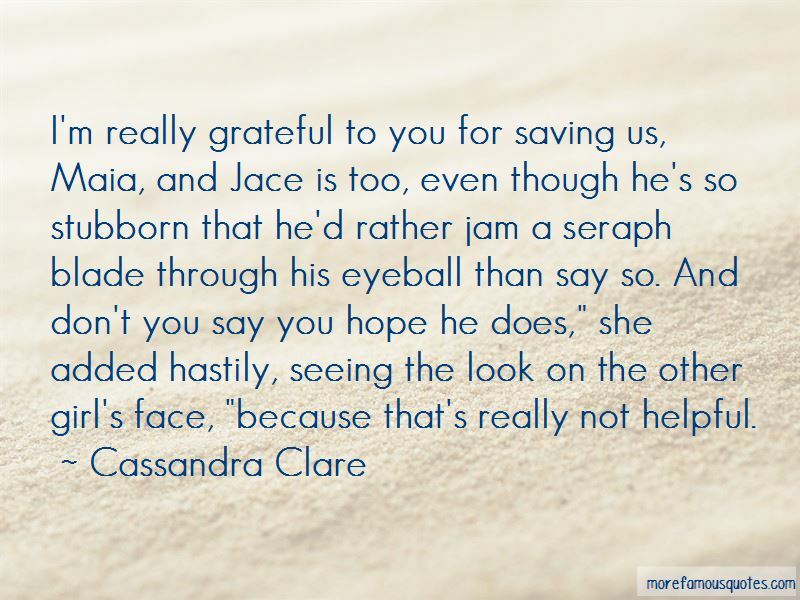 I'm really grateful to you for saving us, Maia, and Jace is too, even though he's so stubborn that he'd rather jam a seraph blade through his eyeball than say so. And don't you say you hope he does," she added hastily, seeing the look on the other girl's face, "because that's really not helpful. Maureen clapped her hands together. "Oh," she said in her elfin little voice. "It's pretty." "I never date anyone my cat doesn't like," Magnus said easily, and stood up. “She warned me about Mr. Herondale, though, said he'd likely be rude to me, and familiar. She said I could be rude right back, that nobody would mind." “You're the shape-changer aren't you?" he said. "Magnus Bane told me about you. No mark on you at all, they say." Tessa swallowed and looked him straight in the eye. They were discordantly human eyes, ordinary in his extraordinary face. "No. No mark." He grinned around his fork. "I do suppose they've looked everywhere?" Luke opened the pizza box and, finding it empty, shut it with a sigh. wolf out and eat me? Humans are animals. Pain is their nature. I only have two reactions to bad news. Uncontrollable rage and then a sharp left turn into boiling self-hatred. I am not perfectly certain I believe in marriage. Why have just one bonbon when you can have the box? 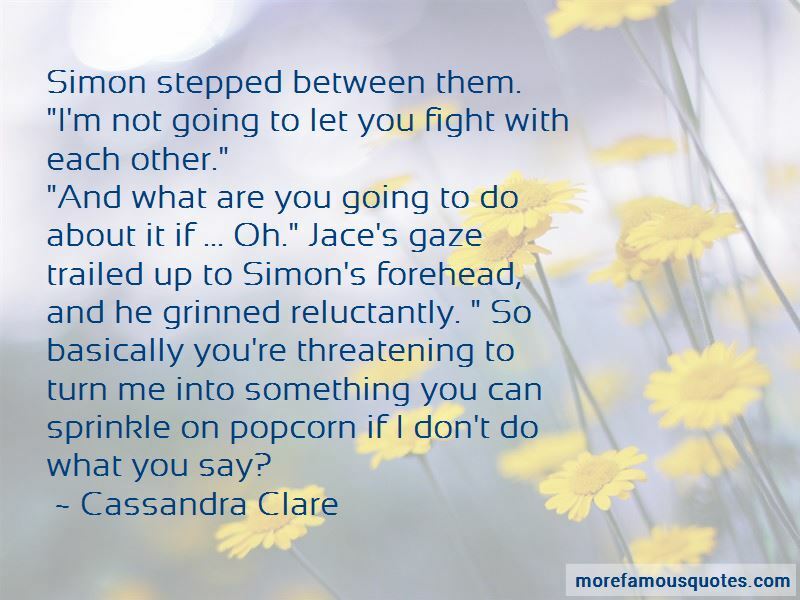 Want to see more pictures of Cassandra Clare quotes? Click on image of Cassandra Clare quotes to view full size.